Brother P-touch electronic labelers uses unique and advanced laminated tape technology. Brother has a wide variety of tape colors, widths and styles. Your applications and your choice of P-touch model should guide your ultimate tape selection. Our tape selections include both laminated and non-laminated tapes with a variety of adhesive choices. The information on this site should help you determine the correct tape for your specific application. Brother's laminated labels are p-touch tough and holdup under extreme conditions. P-touch TZe tapes are the only tapes available that have a unique lamination, which makes the labels heat, cold, water, chemical and fade resistant (perfect for use outdoors, cold environments and near food). The Brother labels are extremely durable, have a professional finish and will outlast other labels. With over 100 tz tape and m tape colors and widths to choose from, getting organized is now easy. Here are some popular label searches. There is a variety of P-touch tape types, colors and sizes to choose from to suit the P-touch electronic labeler you are using. Laminated tape sticks to virtually any surface and is durable enough to withstand scrapes and abrasions. Because it's water resistant, it can be used outdoors, as well as indoors. It shrugs off spills of any kind; from water, to oil, to chemicals and won't fade under harsh UV rays. And it stays on through hot and cold environments from freezers to microwaves. Brother has laminated tapes down to a science, these labels are ptouchtough. This tape has a background that stands out more than standard color tape and is very eye-catching. Some of its best uses are for warning and instruction labels in factories and advertising labels in stores. This tape is made from cloth so that after letters are printed on it, an iron can be used to stick this tape to some other piece of cloth. This tape allows letters to be printed on it to be transferred by ironing to a piece of fabric. It can be used to place the names on smooth surface fabric like the 100% cotton used in uniforms. Clothing with letters transferred to it can be dry-cleaned, or washed. This tape has a special adhesive so when the label is peeled off it leaves a checkerboard pattern. Use it for labels that must not be peeled off such as company assets. Perfect for wire wrapping, cabling and other curved surfaces. This specially designed tape can be used for telco and datacome applications. Non-Laminated Metallic Tape is also known as "M" tape. This tape is non-laminated and prints black letters on durable color tape. This tape should be used for indoor, temporary use. HGe tape is a new tape designed for commercial and industrial labeling applications and provides enhanced speed on Brother's EDGE E-Series models. These tapes are not compatible with every model so check your user guide or view product details. These p-touch labels stay on under both normal conditions and in harsh indoor and outdoor environments. Standard adhesive and Extra Strength adhesive tapes come in 5 piece bulk packaging. HSe tube is a printable heat shrink tubing designed to mark cables, fiber and wires. 1. Kept out of direct sunlight. 2. Temperatures ranging from –10 degrees C to + 45 degrees C.
3. Humidity ranging from 5% to 80%. 4. Kept away from direct exposure to water and/or chemicals. Why do Brother P-touch laminated labels last longer? Unlike ordinary labels, Brother's unique laminated tape technology ensures that a layer of super-clear polyethylene laminate protects your text. Brother P-touch laminated TZe tapes consist of six layers of materials, resulting in a thin, extremely strong label. Characters are formed with a thermal transfer ink and sandwiched between two protective layers of PET (polyester film). The result is a virtually indestructible label that can withstand even the harshest conditions.In fact, we are sure about the durability of our labels because we’ve tested them to the extreme, against the effects of abrasion, temperature, chemicals and sunlight. Results prove that Brother P-touch laminated labels out perform competitor labels, staying legible and affixed, so you can be confident of a professional quality label that has been designed to last. And Brother can prove it. The following will show you exactly p-touch labels are tested to the extreme. 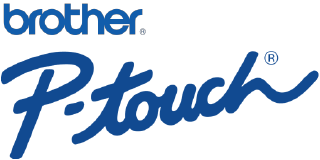 Brother’s patented tape lamination technology ensures that Brother P-touch laminated labels can withstand even heavy abrasion...Wow, that's p-touchtough!The Abrasion Test ProcedureA 1kg sanding device was passed over Brother P-touch laminated labels, and non-laminated competitor labels. After 50 return passes the characters underneath the Brother P-touch laminated label were completely unaffected and the lamination was only slightly scratched. Whether you want to use our labels in freezing conditions or alternatively in extremely warm environments, our labels have been designed to last, we know this because we've tested them to the extreme. In fact, results show that Brother P-touch laminated labels can withstand temperatures from -112° (-80°C) to 356° (150°C). Wow, now that's p-touch tough! The Temperature Test Procedure. Brother P-touch laminated labels, slightly roughened with abrasive paper, were attached to stainless steel then heated and cooled. After 240 hours at -112° (-80°C) no noticeable change in tape adhesive or color had occurred. After 240 hours at 356° (150°C), despite slight discoloration, the text on the label remained completely intact, and the heat actually increased the tapes' adhesive strength, due to a slight softening and spreading of the adhesive. * We recommend TZeS941/TZeS951/TZeS961 (Black on matte silver) as most resistant to high temperatures in terms of discoloration. Wherever you use P-touch laminated labels, they have been designed to stay as clear and legible as the day they were applied.The Fade Test ProcedureSeveral Brother P-touch laminated labels, in various colors, were attached to coated metal plates and placed inside a fade-inducing chamber at 181.4° (83°C). They were left for a period of 100 hours to simulate a year in sunny surroundings and then inspected for any obvious changes. The text color remained unchanged and so all characters were still completely legible. To the naked eye, the tapes' background color showed no change, except for the yellow tape which showed some slight fading. Stage 1: Water and Chemical Submersion Test Procedure to test Brother P-touch laminated labels against the effects of water and chemicals, the tapes were firstly attached to glass slides and immersed in a variety of liquids for 2 hours. No change in appearance or structure of the labels occurred, and the labels remained affixed to the slides. Although some labels soaked in certain chemicals showed minor changes, rubbing the labels with the same chemicals had no effect at all. So even if chemicals are spilled on your Brother P-touch laminated labels, a quick wipe should be enough to prevent any damage. Stage 2: Water and Chemical Abrasion Test Procedure. Brother P-touch laminated tape was affixed to several glass plates. A 500g weight with a chemical and solvent infused cloth was passed over each label 20 times. As the results below show, the print quality of Brother P-touch laminated labels was unaffected, unlike our competitor’s non-laminated labels. The Adhesion Test ProcedureTo test the adhesive strength of Brother P-touch laminated tapes, 12mm standard tape and extra strength adhesive tape were affixed to a variety of objects, all with different surfaces, and left for 30 minutes. Adhesive strength was tested by removing the tape at an angle of 180 degrees. This testingmethod complies with Japanese Standard JIS Z0237 testing for adhesive tape.Test ResultsThe table explains that an adhesive strength of approximately 6 Newtons* was maintained with most materials. Our strong adhesive tape maintained an average of 50% more adhesive strength compared to our standard tape and is suitable for more demanding surfaces such as polypropylene. Brother P-touch laminated tapes are available in a wide range of tape colors, widths and styles. Your application and your choice of P-touch model should guide your ultimate tape selection. The links below will also help you to determine the correct tape for your applications.